A couple weeks back, I went to a swap meet at my FLGS to unload some minis I'll never get around to painting. 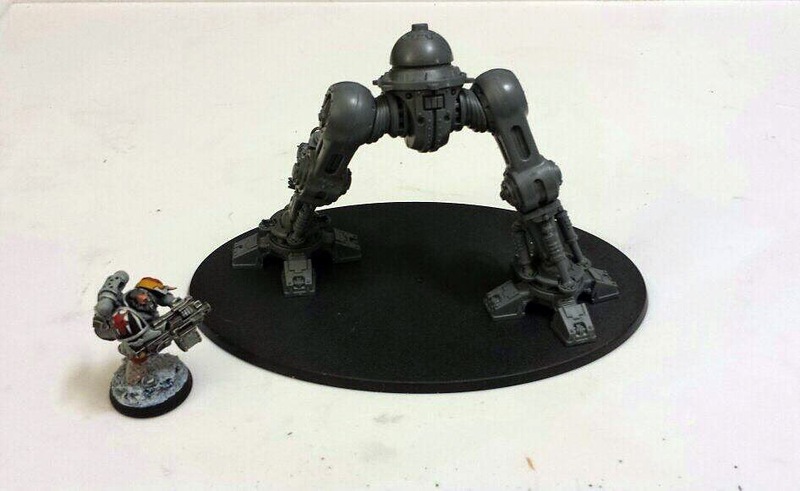 The hope was I'd sell enough stuff to be able to buy and Imperial Knight, and I did just that! He only cost $40 out of pocket. Quite a nice deal, I'd say. What is that? Can I kill heretics with it? I tried to plan out how many pieces I wanted him to be in for painting- turned out to be a lot. He has a lot of parts to him, and I want to make the painting process as easy as possible. I left all his armor plates off, and kept his arms, his legs, and his torso separate. I have blue stuffed him together several times, for test fitting but also for my very first game of 7th! Despite having no arms, he did very nicely for himself. I think he brings a lot to my Space Wolf army that it really needed. I'm a little disappointed he can't just reach up and swat fliers out of the sky, but you can't have everything :-) . Trying to position his arms was tricky. Eventually he did get his arms. I opted for the Knight Errant version. I really, really like that giant melta gun. The points of articulation on him are awesome, it makes customizing his pose a breeze. But it was a little involved trying to get him to look just the way I wanted while trying to hold 6 places still. I got there eventually. 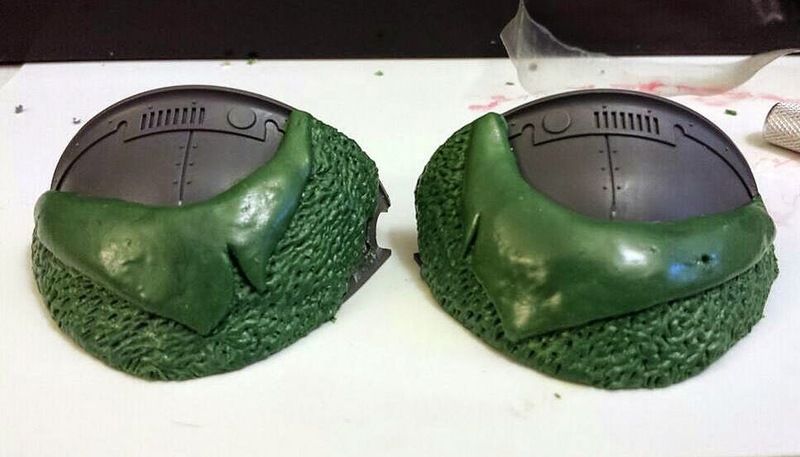 It might look familiar- there's a variant Space Wolf shoulder pad that looks just like this. That's what gave me the idea. For my first attempt really sculpting anything from scratch, I am very pleased with how it turned out. I am going to paint some runes along his armor as well, but as far as conversion work goes, that's about the end of it. I didn't want to over power him with all kinds of crazy stuff. But I did dig through my bits box and come up with a few choice pieces to add to him for a little more character. Originally, I was thinking of painting him mostly white with bronze accents, but I am wavering on that now. It was going to be difficult to paint and I was looking forward to the challenge, but now I'm not convinced that it will really look all that good on the table. I've envisioned him as a Freeblade, so I've really run a little wild with his history. He's aligned himself with the Wolves, so his heraldry would reflect that. I'm thinking of calling him The Boot of Russ. I am thinking of a heraldry consisting of a dexter wolf head and a sinister Imperial Eagle. I was going to have the wolf black with red background and the Eagle black with a yellow background. Red and yellow are the accent colors on my Wolves, so he'd tie in with them. Not sure on any of the colors now, as I am rethinking his whole scheme. The sculpting is nicely done. I wish I could do fur like that. Did you use a press mold for the fur? White and Bronze I think would look ok, but I think it would be really hard to pull off. It would look good for a Winter Wolf kind of theme. Maybe more of a creamy white than a pure white? I was thinking P3 Menoth White Base, Menoth White Highlight, and White higherlights. Just thoughts. I'm sure anything you do will end up looking good. For the fur, I actually used a Thunderwolf's tail. I pressed it into the GS to give it the basic texture and then used my sculpting tool to work it a little more. I'm thinking of abandoning the white altogether. Maybe going with my first idea of doing him light blue. I dunno. 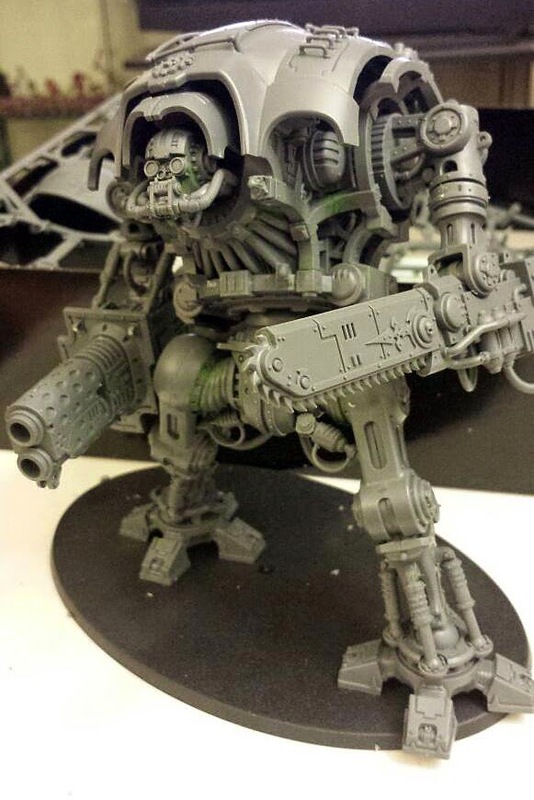 Why not paint him as one Giant Space Wolf? That is what I am planning with mine. One Giant Dark Angel. 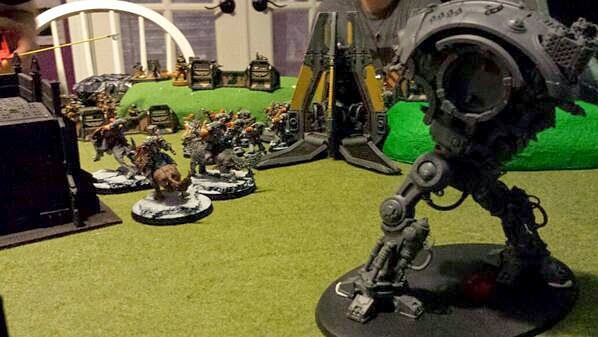 I think of all the space marine chapters, Space Wolves and Dark Angels would look awesome with a Giant version. And that was a cool idea for the fur. Probably cheaper than the press molds, and smaller too.